exploring Himalayan wonders on mountain bike and more different ways with heart and soul……..requires sense of adventure!!! Those who are seeking for best biking experience in the Himalayan – Annapurna round trip takes one of the most challenging exploration journeys for life time. Where you will discover one of the great ranges if biodiversity on Earth. The amazing views of pristine snow clad mountains and top to bottom colorful ethnical cultural activities of locals of around makes the mountain biking trip unforgettable. Besides the entire biking trip also leads you cross the biggest Thorung La Pass (5416m) second highest lake and deepest gorge of the World exploration. The wonderful panoramic spots are also well known photographic destination among the adventure lovers. Via Thorung La Pass- 5416m, and 2nd highest Tilicho Lake. Day 03: Drive to Bhulbhule (760m) by private Jeep and warm up bike ride an hour to Ngadi (930m) and overnight at tea house lodge. Day 04: Ride the mountain bike up to Jagat (1300m). Day 05: Ride the mountain bike up to Tal (1700m). Day 06: Ride the mountain bike up to Chame(2670m). Day 07: Ride the mountain bike up to Pisang (3200m). Day 08: Ride the mountain bike up to Manang (3540). Day 09: Acclimatization/ exploration lay over day. 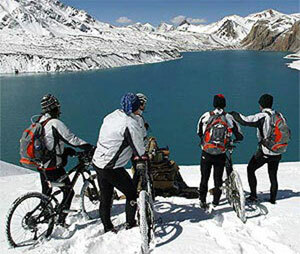 Day 10: Ride the mountain bike up to Tilicho Lake (4919m). Day 11: Exploration day around Tilicho Lake. Day 12: Ride the mountain bike up to Yak Kharka (4018m). Day 13: Ride the mountain bike up to Thorung La Phedi (4450m)/ High camp. Day 19: Ride the mountain bike up to Pokhara, Lake Side (820m), end the Annapurna Circuit Mountain Biking trip and transfer to hotel. Day 21: Transfer to airport and final departure. Personal expenses such as laundry, telephone calls, alcoholic beverages, bottled drinks (including cold drinks and mineral water), tips for guide and staffs etc.